the Money Gram is good too.the fees is lowest than W/U.so , if you like,you can use it also. It will take about 3--5 days to transfer the money to our account. Please contact me and tell you the our accounts details. note: we stop use paypal.Because paypal is unstable online payment system here, we receive too many fraud payments. Our profit is very low, fraud payment already hurt our business running. 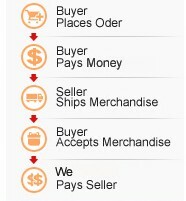 Since of this reason, we decide stop paypal payment. I apologize this inconvenience to you!